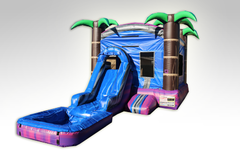 Combo bounce & slide rentals are the best way to get the most value in your party rental, while adding tons of fun for your little guests. 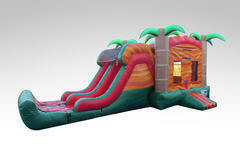 These Combo Bouncers get their name from being a "combination" of the popular bounce house and additional exciting features like climb & slides, basketball hoops, and popup obstacles. UFO Party Rentals even has combos available that are approved for water use, so you add the excitement of a water slide to your rental. Browse the selections below and click on the "More Info" link for more information and to make a reservation.